How would you like the chance to win yourself $300? The giveaway is presented by Shopping Links in honour of FemaleBloggerRT reaching a massive 30,000 members and it is a worldwide giveaway. 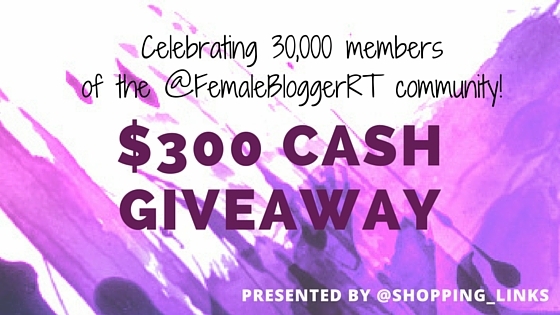 FemaleBloggerRT is the original retweet community for bloggers. I use the FBRT regularly to boost traffic to my daily blog posts and they are also on Instagram too. To take part in the giveaway, all you need to do is complete the Rafflecopter widget below! What a great giveaway! I've never heard of FemaleBloggerRT - I will have to check them out! Thank you for introducing me to FemaleBloggerRT, they look very useful. How cool! I've also been using FemaleBloggerRT for a while, on twitter. Didn't realize they were also on Instagram. So cool! I entered. Fun fun! What a great giveaway!! I just entered! Lovely giveaway :) I love these kinds of accounts that help you promote your work as a blogger. I would love to check out female blogger and post my own blog. Great giveaway! Yay, luv to read female blogger. Divine. Wow, prize paypal gc is fab. & splendid. 2 fingers snap. It is tight, fly & off the chain. Thank you for the awesomeness, the contest, and generosity. :) Pick me, pick me! Dear Santa: I’ve been nice. My X-Mas wish this year is to win this contest. Starving artist here desperately needs the gc to shop and eat. A life changing exp.